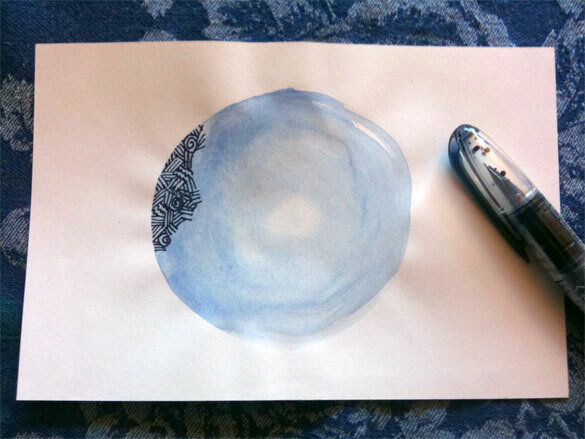 The same day I did the tea washes, I did a few watercolor washes as well, just simple pale circles to do something with later. When I took this one back out the other night, it reminded me of an eye, but also of a pale, cool moon floating in its own gentle glow. The paper around the circle is a bit warped, giving it a touch of subtle halo, which you can just barely see in the image above. I used the same crosshatch pattern as I did with Blood Moon, only this time I used a deep blue-black rather than the bright red. Instead of adding texture with a contrasting color of ink, I put an abstractly slitted pupil into the center of the white “eye” that gave the whole image an ornate feeling. The high contrast between background and foreground gives this piece much more deliberateness, and this thinner sketchbook paper also held the ink better, with less bleeding. 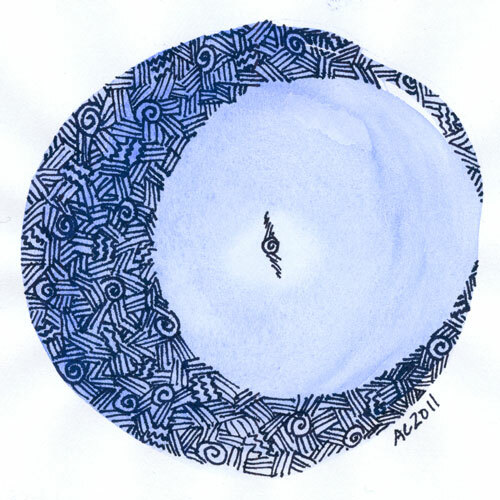 Eye of the Moon, 7″x5″ watercolor and pen & ink on paper. I took a progress shot with my iPhone right after I started, so you can see the texture on the wash without the interference of the pattern.